How is the Gita practically applicable in my life? 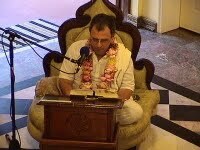 Ramiya dasa is a disciple of His Divine Grace A.C. Bhaktivedanta Swami Prabhupada. He lives in Alachua, Florida USA, and has been studying, teaching, and practicing Krishna consciousness for over thirty years. Krishna.com was fortunate to have him host our live video series of Bhagavad-gita classes, which includes questions and answers from our online audience. Like to hear a class by Ramiya dasa? click here. Take an online eCourse to study the teachings of Lord Krishna. Listen to our Bhagavad-gita audiobook and hear the full text online. Join our e-Book club, and read a little Bhagavad-gita every day. Read Bhagavad-gita As It Is online, at Vedabase.net.